You may have a brick-veneer home like Connie. The brick is just a facade and offers no structural support. Unfortunately, the Three Little Pigs fable has helped foster the perception that brick homes are resistant to huffing and puffing. It’s possible to build a brick-veneer home that doesn’t allow water inside your home, but it requires a vast amount of attention to detail. Your brick is leaking because of micro-cracks that exist where the mortar touches the brick. 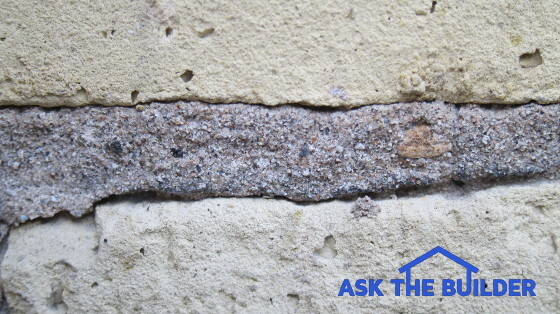 The shorter vertical mortar joints are much more susceptible to water infiltration than the horizontal mortar joints. Water leakage is usually not an issue in a gentle rain shower. The wind-driven rain that pelts the brick is where the issue mushrooms. The pressure of the wind blasting the brick forces water into the micro-cracks. Each successive raindrop that crashes against the brick is like a miniature hammer that pounds the previous drop farther into the brick. Soon water is streaming down the backside of the brick where it’s less than an inch away from the wood framing of your home! You can see why it’s imperative to have a waterproof membrane covering the wood framing to protect it from liquid water. The water that flows to the bottom of the brick must be captured by a flashing. This water needs to be redirected to the outside of the house in a continuous pathway that’s immune from getting clogged by the mortar as the bricklayers install the brick. Your best bet at minimizing water infiltration at this point is to inspect the brick for any large holes or crack where the mortar touches the brick. Repair those with new mortar that’s made using hydrated lime and fine silica sand. The second step is to apply two coats of a silane/siloxane solvent-based water repellent to the face of the brick. You need a helper to do this. The helper wears a backpack leaf blower and blasts the wall with air as you spray on the water repellent. This air forces the liquid deep into the brick to help block water pathways. There’s no such thing as an embarrassing or silly question. Everyone has to start somewhere and I remember cutting my first piece of drywall. The pros use a sharp razor knife to score one side of the paper face on a sheet of drywall. When you apply pressure to the other face of the drywall panel just behind the score mark, the sheet of drywall snaps quite cleanly in a straight line. The key is to have a sharp razor that cuts through all the paper and into the gypsum core about 1/8-inch in one pass. Be very careful the knife doesn’t slip and cut any other part of your body that might be in the way. A circular saw creates massive clouds of dust and should be avoided. Small handheld human-powered plunge saws are a great tool to cut curves, circles, and rectangular holes. Electric rotary saws with special high-speed bits that have cutting edges on the bits are what pros use to cut these curves, circles, and holes. You can get special small dull plunge blades that fit on electric reciprocating saws to cut drywall on walls and ceilings. The dull nature of the blade helps to prevent cuts in hidden wires and pipes.